Since i stated college again last week, i realized food prepping was essential especially since i commute to campus everyday. I like bringing my own lunch because the food at my school is full of fast food joints. Bringing my lunch enables me to make better eating choices and i get to save so much money. Here are a couple things i like to make on a school day in the mornings and what i like to pack in my lunch. I like to make this when i have a little extra time in the morning. This is a better option then heading to the drive through at a fast food location in the morning. Add non-stick spray to a pan and turn on your stove to medium heat.While the stove is heating up place your english muffin in a toaster. In a separate bowl separate your egg whites from the yolks, add a pinch of salt and pepper, and whisk with a fork until frothy. Once the pan is heated up add your egg whites and once they brown flip them over. 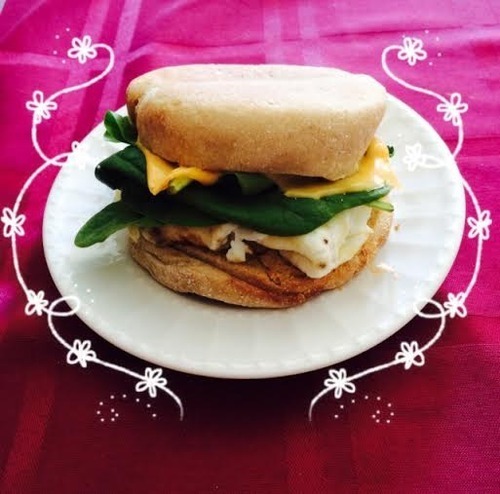 Then you get your English muffins and place the eggs on top. I usually flip the eggs over a few times so that they fit inside the English muffin. Finally add your spinach and cheese on top and you’re set to go. On the days where i am rushing i usually opt for a smoothie. Not only is this recipe super easy and fast to make, you also get some vitamin C to start off your day. 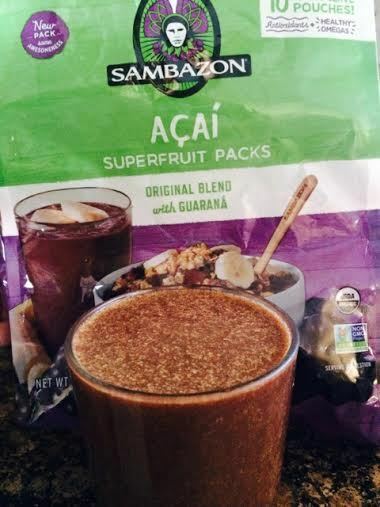 Directions: In a blender add in the acai, strawberries, banana, and orange juice. Mix and enjoy. Heat up your tortilla. Once it is heated up, place it on a cutting board. Spread your ranch dressing all over the tortilla so that everything sticks together when you cut the wrap in half. If you want a healthier option you can use a mashed avocado which is just as delicious as well. Next place your turkey slices, tomatoes and spinach and wrap up your tortilla. Then you cut it in half or you can cut it into smaller pieces. 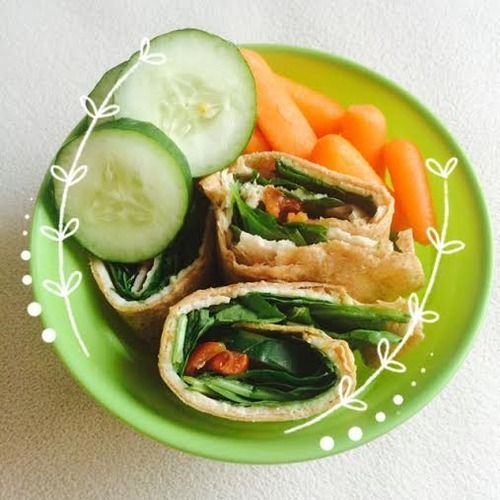 I like adding carrots and cucumbers on the side to enjoy them with the wraps. Quick and easy lunch to pack and take on the go. Enjoy! Protein of choice (I used Tuna) You can also use quinoa or chicken. There are so many options! Place your dressing on the bottom of the mason jar. I like doing this first because it gets less messy. Then add your lettuce and tomatoes filling the mason jar half way. The possibilities are endless so add in all your favorite salad toppings. Then fill the other half with your tuna (or protein of choice) and top with a dash of salt and pepper. 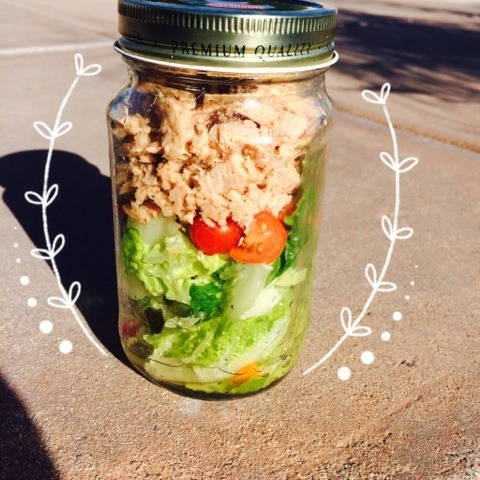 Then you seal your mason jar and when it’s time for lunch you just shake it up and enjoy! Literally just one ingredient! When i come home from school and the gym these are the best! and literally no effort at all to make. High in fiber, 21 grams of protein, gluten free, and only 1 gram of sugar. Open a quest bar and place in the microwave for 10 seconds. This is just going to make the bar easier to mess with. Pre-heat your oven at 350 degrees. Split the bar into 4 equal pieces and roll them into a cookie shape. Once that is done all you need to do is pop them in the oven for 8-10 minutes. Yes it was that easy! Your kitchen ends up smelling amazing once you’re done too. Enjoy! This is part of a series of posts by PumpUp’s losingitwithcassandra. 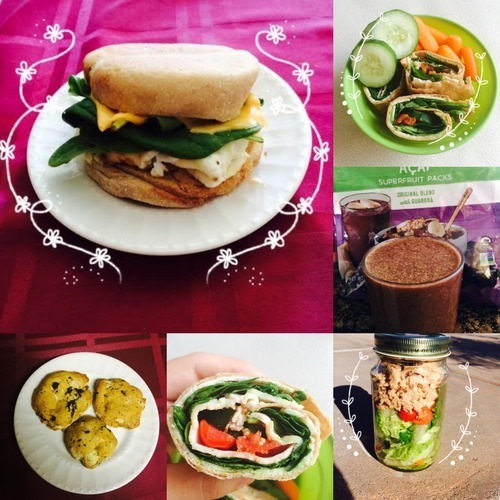 Follow her Tumblr and PumpUp losingitwithcassandra. 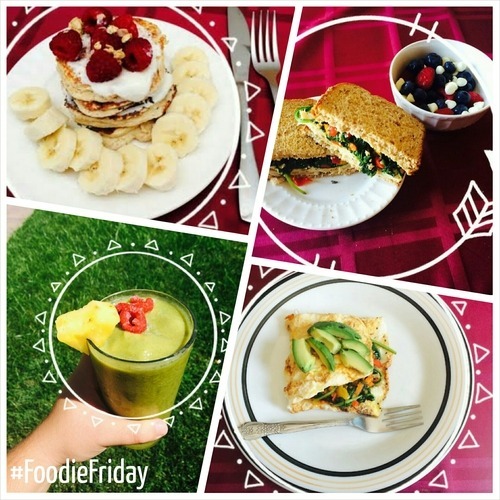 This week’s Foodie Friday kicks off another series of community recipe posts! Forget the instant noodles! 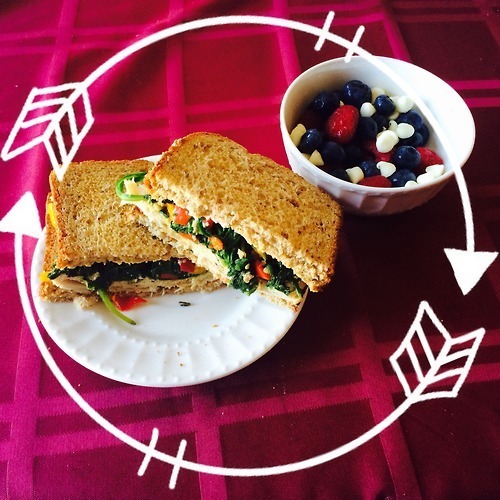 Can college cooking be simple AND healthy? 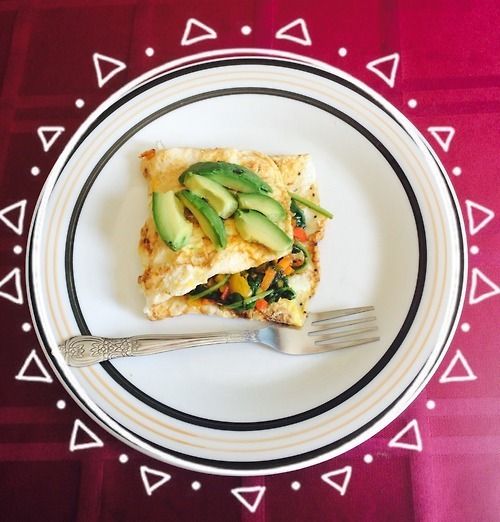 Our vibrant member @losingitwithcassandra shows us how to do college cuisine right. 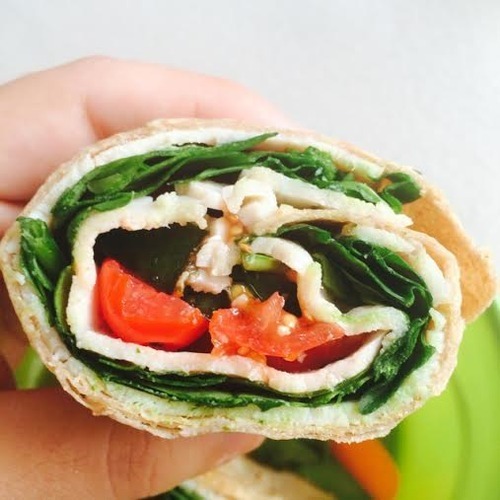 From protein pancakes with vanilla sauce to refreshing green smoothies, Cassandra gives us recipes that are palatable, packed with nutrients, and easy to prepare. 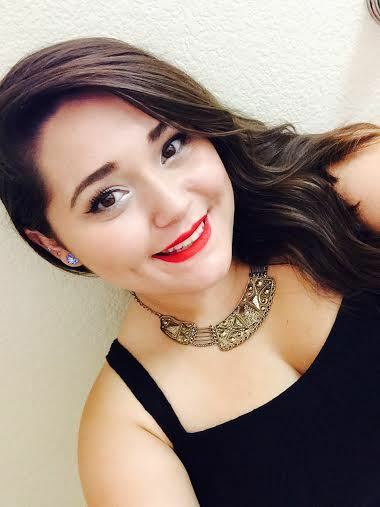 Read below to learn more about Cassandra! 1. In a skillet, add olive oil on medium heat. 2. Once the skillet is heated up, add in the garlic . Once it browns, add in your spinach and chopped bell-pepper. 3. Then add your salt-less seasoning and a dash of pepper and salt. Once it is cooked, put the veggies to the side. 4. Now it’s time for the eggs. I find it helpful to cook the veggies separately to create a perfect looking omelet. In a separate bowl add in 1 egg and 3 of the egg whites. Then add a dash of salt and pepper. This is optional but i like adding a little bit of almond milk to the eggs to make them fluffy. Whisk until mixed. 5. In a separate pan add non-stick cooking spray on medium heat. 6. Once the pan is heated, add in the egg mixture. Once it starts to brown on the bottom carefully flip it over like a pancake using a spatula. 7. Then, get the veggies, place them on top, and flip your omelet half way. 8. Finally add avocado slices on top. 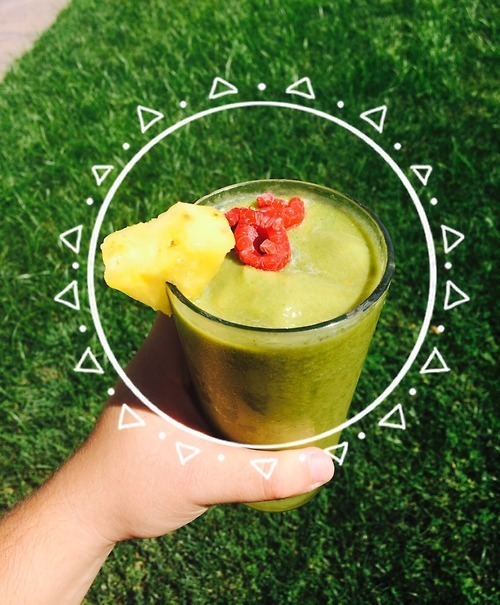 In a blender add the kale, spinach, pineapple, raspberries, and banana. I like to add in more pineapple for a sweeter taste. Add in the juice of half a lime, stevia, ice, and water. Mix until everything is blended up. 1/4 of ared, yellow, and orange bell pepper. 1. In a skillet add olive oil on medium heat. 2. Once the skillet is heated up add the garlic and sauté until golden. 3. Then add your spinach and bell peppers. 4. Add a pinch of pepper, salt, and seasoning and sauté until soft. 5. Toast some bread and add avocado for spread. This is optional but i like using an avocado rather than mayo. 6. Then add your turkey slices and veggies on top. 1. Mix all of the berries and white chocolate chips in a bowl. 1. 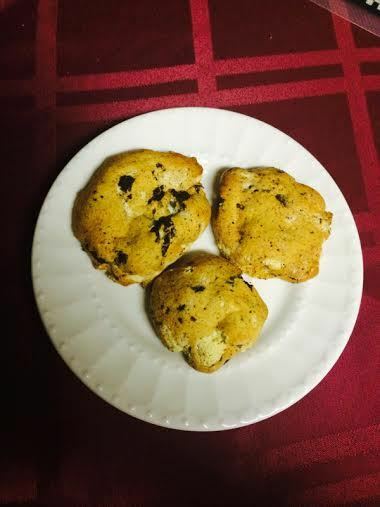 Mix oats, protein powder, and baking powder in a blender until they get a flour consistency. 2. Then add your egg-white, almond milk (or milk of choice) and Greek yogurt in with the dry ingredients and mix until the batter thickens and everything is mixed very well. 3. In a pan add non-stick cooking spray over medium heat. 4. Once the pan is heated you can slowly pour out the batter onto the pan. 6. 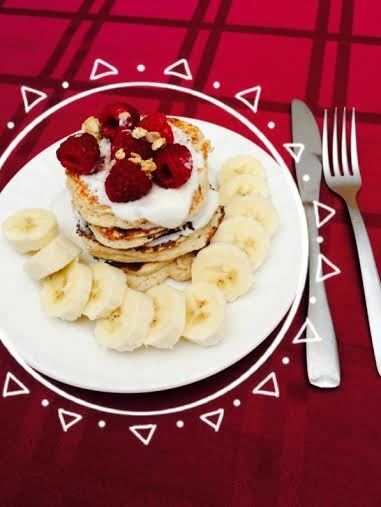 Mix your stevia packet with the vanilla Greek yogurt and add this on top of your pancakes. Her motto? “You are capable of much more than you owe yourself credit to. Keep going, stay strong, and prove them wrong." Well said, Cassandra!